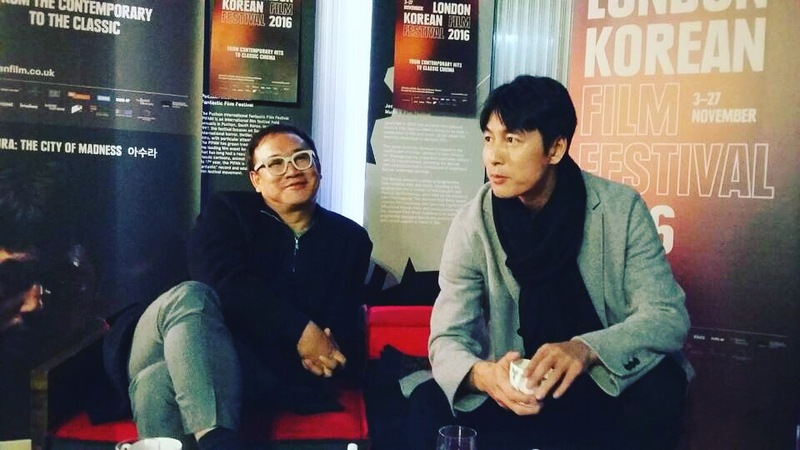 During this year’s London Korean Film Festival, we had a chance to meet and interview- along with MyM, Hangul Celluloid- Kim Sung-soo and Jung Woo-sung. Hangul Celluloid: You’re here promoting Asura: The City of Madness, your latest film, why did you decide to set it in a fictional city rather than in a normal Korean city? Did it give you more freedom to push characters to greater extremes? Kim Sung-soo: As you know that story is kind of ridiculous, so perhaps it’s really hard to set it in a real city. Since it’s told in a very extreme way, like the film Sin City, it had to be set in a fictional place — a city of crime and sin. I didn’t want to set it in a completely unrealistic space, so it is based on Korea 40 or 50 years ago in the outskirts of Seoul. The places are run-down and ready to be redeveloped, and there is a sense of gentrification. So it is where the minority of society dwell, that’s why you see a lot of characters that are on the fringes of society. When gentrification happened in Korean society there is always a fight for power and financial advantages between the construction side, politicians, and local authorities. Although Korea doesn’t have mafia gangs who rule the city, but this kind of conflict between those three powers were quite common as they tried to gain an advantage over society. View of the Arts: Besides directing you have co-written or wrote most of your films, and this is your fourth collaboration together, to what extent did you have characters in mind when you were working on the screenplay? Kim Sung-soo: I’ve been thinking about this story for a long time, although it wasn’t written up fully I had thought about it conceptually for a really long time. I talked to Jung Woo-sung about working on this film together, and I said that I had to work with him. He said it was a bit too dark but I said I really wanted to work with him so he said he would. He’s played these young wanderers in the past and they’re always on the periphery of society, this character was in continuation with those roles. This film revolves around relationships rather than a series of events, he is the only character in this film that interacts with every important character in the film so it was really important for me to have Jung Woo-sung in the role, and it has a connection to the other characters he had played in my films. MyM: Since the last time you worked on a film together was in 2001 what was it like to be on set together again? Kim Sung-soo: It makes me feel old. Honestly, I didn’t realise that 15 years had passed it’s gone so fast. Kim Sung-soo: I’m really close with him and we often talk about ideas and future projects, during this time we were meandering around and worrying about some of the meticulous things. I’ve learned one thing from my life, if you want to make something good and you have a good partner don’t hesitate. Jung Woo-sung: It was very familiar and we were just regretful and asked why didn’t we work together. It was like a return of lost time in some ways when we made this film. Hangul Celluloid: Going back to your earlier career, probably more than any Korean actor you have had a persona of the upstanding leading man for a lot of your films. When you made the film Cold Eyes a lot of people were surprised and happy that you were playing a character that was so dark, and so different from your much loved following. Why did you choose the film at that point? And have roles since been influenced by it? Jung Woo-sung: In fact, when I choose a project I always choose leading roles so I didn’t think too much about supporting roles to be honest. I never thought I would be interested in being a supporting character, but in the case of James he has such charisma and the tension of his role is crucial to sustain the film. I wasn’t offered the role initially, I was asked to review the script and that’s how I got to know about the project and I found that the tension, charisma, and importance of this character actually completes the story so I thought if I didn’t take the role I would regret it. After I had done this project my perception of leading and supporting roles have actually changed, and I have become much more free when it comes to choosing my roles since then. When it comes to being Mr. Romantic, I actually wasn’t really aware of this perception and people’s expectations of me. I don’t really think about it, I always want to try out different roles and for me it was such a natural development so I don’t think playing an evil character would be very cool and attractive, but this tension that James carries is very special and I thought that rather than him dying in such a cool way he could have gone in a more ridiculous way. View of the Arts: Given that your past characters and your one in Asuraare very different did you approach the role in a different way to your previous characters? Jung Woo-sung: Actually recalling this period I’m not sure how I did it. So focusing on the world view that’s hidden behind the script was important, the message that Kim Sung-soo wanted to give seemed clear but it was also incomprehensible to me, so this is a story he wanted to tell but it is steeped in the character of Han Do-kyung and that is something I thought was key. The main character in a film always needs to be very convincing to audiences, but this particular person he’s the kind of person that will have a bare-fist fight with people. That was what I was given, and that was the challenge. Kim Sung-soo: He was very confused at first on how he could interpret the role by himself, he was continuously asking what he can do but I couldn’t help him. I could only say that the character was living in his hell, and the only way to become this character was to jump through hell. I know him very well, and he is the kind of person that doesn’t complain. But when we were making this film he says to me ‘hyung this is really tough’ and he never says this, and the day before shooting he asked me to come to his room and he was drunk and we normally don’t drink before shooting and he said that. Secretly I really appreciated this because it meant that the real Jung Woo-sung was living in hell, and I was really happy to hear that. MyM: Your character does seem to go through hell, and during the film he has a lot of intense interactions with others throughout. You particularly go head-to-head with Hwang Jung-min’s character Park Sun-bae a lot, what was it like to work with him on these scenes? Jung Woo-sung: Yes, I deeply appreciate his performance and him as an actor, he’s also really fun. I think he’s extremely unique because he has various textures as a performer, and the relationship between Park Sun-bae and Han Do-kyung works in a way that his character is in charge of the reaction of my character. He reacts to the events that Park Sun-bae sets out, either by pretending or being influenced by him, so perhaps it was a bit easier for me to perform than Hwang Jung-min. The amount of energy he gives to an actor on set is enormous. I feel like through him the character energised those around him. Especially the very last scene, he as an actor truly does exist as Park Sun-bae so what he sets out in the scene and his energy really influences the performances of the other actors around him so we all perform at our best. Hangul Celluloid: You recently starred in a very small production calledDon’t Forget Me directed by Lee Yoon-jung, the film wouldn’t have been made if it wasn’t for you. What do you think about the difficulties faced by new directors that have to go through crowdfunding for productions that really should be easy to make? Jung Woo-sung: It started as pure chance but it gave me experience as a senior, in Korea its known as being a Sunbae, so whoever started their career first has an unspoken responsibility to support their juniors. I had this sort of relationship with the director, she had worked on The Bad, The Good, and the Weird in the past and she’s also a fan of mine. I wanted to help her out, it started as a short film script and it developed into a feature length film. She had never directed a full-length film before so as her senior I introduced her to a lot of female producers, but they were often very low-budget or they tried to change the script, so out of respect to her I took the role of a producer and worked on this film in this respect as well. We both matured through this experience and we both learnt a lot through this process.